Stains can happen in any type of Swimming Pool! 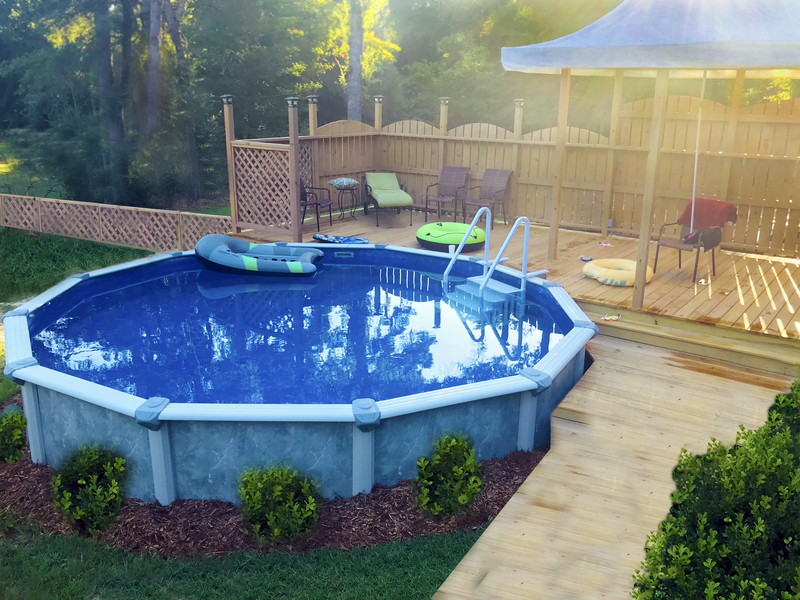 No matter what type of swimming pool you have, whether it is a gunite, fiberglass, or vinyl liner swimming pool, you can get stains that may ruin the look of your pool. 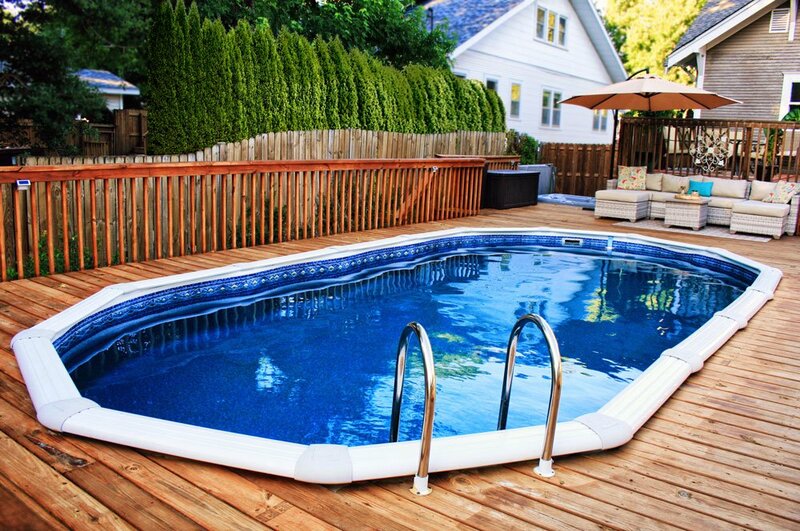 The stains can be caused by organic materials such as plants, leaves, and even small branches falling into your pool. Stains caused by organic items have a tendency to be black or a tann-ish brown, almost rust-colored stain. 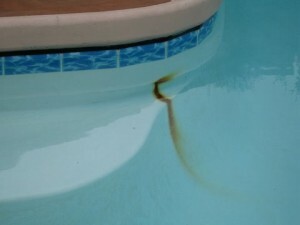 Metals can also cause staining in your swimming pool, especially if you are using well water. However, metals such as magnesium, iron, and copper can be found in all types of water. Stains can also be caused by having low pH or total alkalinity levels. Low pH or total alkalinity can also cause any metal pool equipment such as heaters, ladders, or pool lights to corrode. Determining what type of stain you have is important to determine what course of action you will use to treat the stain. We do recommend that you follow a regular weekly maintenance schedule to keep your pool in tip top shape and STAIN-FREE! Royal Swimming Pools offers several products to help keep stains from building up in your swimming pool. Stains and scaling can be caused by not keeping your swimming pool water balanced, which means keeping chemical, pH, and total alkalinity at the proper levels. Tile and water line cleaners help remove scale, grime, oils and other materials that can float on top of your swimming pool water. They help clean those unsightly lines that can form on your swimming pool tile, vinyl liner or even your swimming pool steps. Rust and scale remover (which can be known as metal-out) also helps in preventing stains and scaling. It is especially important to use in areas that have high levels of minerals and metals in the water and areas where consumers are filling their swimming pools with well water. It is very important that you have your pH levels in the proper range when using this product for it to work effectively. Hardness increaser helps to prevent staining of swimming pool surfaces caused by low hardness (which is calcium) levels. There are areas in the United States that have soft water, which means they have low hardness levels. It is important to use hardness increaser in those areas to prevent your pool water from becoming corrosive, which can cause damage to your swimming pool heaters and pumps. Gunite swimming pools usually require a little more work when they get severely stained. Many times they will require that you have a swimming pool professional perform an acid wash on the cement, to remove all the extreme stains and scaling.